Like a lot of other people I do have some things on my mind I think others could benefit from knowing, or they could point me to an even better solution than the ones I present here - because I am sure there is. 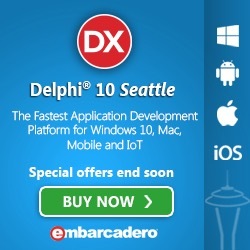 I have over the years been using a number of computer languages - but the majority of the time it has been the Delphi dialect of Object Pascal - so expect that to show in the posts. Please do not start any discussion on whether one language it better than the other - that would be like arguing if Swedish is better that Greek - I might myself fall into that trap. The intention of this blog was also to document some of the various "fixes" I have done by code, which I often spend more time digging out of my memory, when people asks how to do this and that, than it took implementing them. Find next in TClientDataSet - and maybe FDMemTable? Size of executable, should we care? Well if someone has read this far and has a preference of order for some of the post topics mentioned - leave a comment.